Lantz is a small, sleepy village about 25 km north of Pamplona in Navarra which comes alive 3 days a year during its unique carnival – one of the most important and popular ones in the region. The festivities, which take place on the Sunday, Monday and Tuesday coinciding with carnivals elsewhere, focus around certain entertaining characters. The area was formerly much-frequented by bandits, being as it was a major passing point to and from France over the Pyrenees. According to legend, the most notorious was Miel Oxin, and as local residents became tired of his endless bad deeds, they decided to capture him. 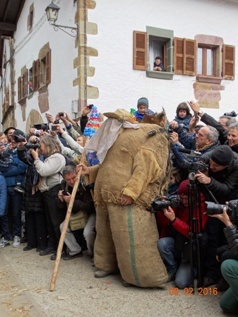 This character is depicted during carnival as a 3 metre high wooden structure stuffed with hay. Locals would meet in the village inn (posada) and plot how to capture him, with the most corpulent one being chosen to grab Miel Oxin once he had been caught. 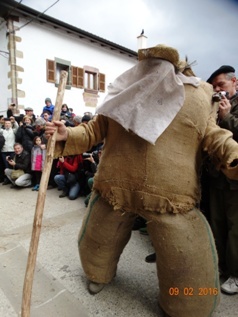 This is Txiripot, a huge, sack man-like character. 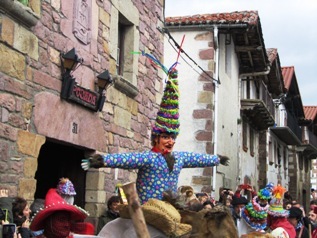 During carnival, villagers stuff Txiripot full of hay and ferns in the attic above the posada, so much so that he ends up becoming hugely corpulent and clumsy, needing a stick to walk. Another major figure is Zaldiko, Miel Oxin’s trusted horse, who again according to legend tried to prevent his owner’s capture and, once the former was captured, tried to free him. This character is again covered in sacking within a rectangular wooden structure, with a U-shaped head and a real horse’s tail behind. Once the entourage leaves the posada, Ziripot is continually pushed over onto the ground by Zaldiko to prevent him from capturing Miel Oxin, which makes for a lot of entertainment. 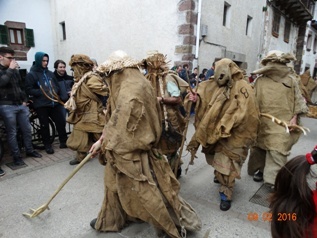 Around 50 locals dress up as txatxus, depicting the residents who capture Miel Oxin. They wear colourful clothes and their faces are, like Txiripot’s and Zaldiko’s, covered with netting or scarves, also sporting animal furs and mostly wearing strange tall, cone-shaped hats. Armed with brooms, they run through the streets of Lantz trying to attack anyone who crosses their path while emitting high-pitched shrieks. Last but no means least are the herreros or blacksmiths, of which there are between 8 and 12, whose job is to try and brand Zaldiko in order to tame it and thus render it helpless in its attempts to rescue Miel Oxin. These particularly sinister looking characters are also dressed in the omnipresent sacking and, wielding scythes, look not unlike a small army of grim reapers. The actual kalejira or parade during carnival takes place on 3 consecutive days. A few minutes before the entourage leave the posada, the herreros emerge from a neighbouring house and head down the main street to the old blacksmith’s house, where they lie in wait to brand Zaldiko as they all pass by. 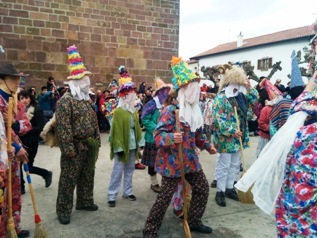 After successfully doing so, the rest of the entourage continue through the village’s narrow old streets back towards the posada, where they stop at the pelota court to dance what is known as the Zortziko. The festivities end on the last evening (Tuesday) when the captured Miel Oxin is tried and burned, surrounded by all the Zortziko-dancing participant villagers – and that, in a nutshell, is the Lantz Carnival! We had dinner last night with Nina and Bob Brock whome you met last year. We are from the same towns, Hailey and Sun Valley near Boise. Our daughter is a nurse in Boise and we go to the festivities of the Basque people there and in Elko Nevada. We are coming to your coastline in October, 2017 and would love to meet you. Also I’d love to have your walking tour of foothills and borderlands of the Basque Pyrenees if you could send it. Tell me how much to send you.